It is with great sadness we announce the passing of John Daniel ‘Putt Putt’ Campbell on December 21, 2018 at New Waterford Consolidated Hospital. He was the son of the late Fess and Mary (Hannigan) Campbell. John lived in New Waterford his entire life and for many years he was employed as a coal miner for DEVCO Corporation, a career he truly loved before his retirement in 1986. 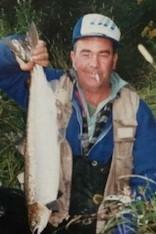 He was an avid outdoorsman and loved anything to do with nature and wildlife including hunting and fishing or in later years just relaxing in the cabin at his favorite place on earth, Lake Anslie. Over his lifetime John enjoyed bowling, darts, card games, fly tying, his beloved Blue Jays on TV and spending time with family and friends. John is survived by his beloved wife, Valerie; children, Gerald (Peggy), Mary, Trina (Dave), Andrew (Cassandra); grandchildren, Kandice, Samantha, Victoria, Connor, Seth, Alex, Leah; great-grandson, Riley; sister, Helen (Philip) MacDonald, best buddy, Alex ‘Sugars’ Leadbeater, and several nieces and nephews. Besides his parents, he was predeceased by wife, Ann Marie; son, Joseph, and brothers, Joey, Vincie (Cathy) and Raymond ‘Moe’ (Charlotte). Cremation has taken place and a graveside service will be at a later date. Any donations can be made to a charity of choice. Arrangements are under the direction of McLellan Brothers Funeral Home, 3183 Plummer Ave., New Waterford, 902-862-7500. To send online condolences, go to: www.mclellanfuneralhome.com.